These animal babies may look cute, but if you take a closer look they're dead on the inside. These killer baby animals have the ferociousness to kill their brothers and sisters in order to survive. Scientists may want to call this "instinct," but it's clear the devil is at play here. Animal siblicide is common within the animal kingdom and all the species on this list are prime examples of just how savage animals - especially young cubs, chicks, and insects - can truly be. From death by impact, stabbing, eating, stinging, and fighting, these killer baby animals are able to do what humans could never imagine: eat their brothers and sisters, and cousins if they're still hungry. The Golden Eagle creates huge nests that average 5-8 feet wide and 2 feet high. 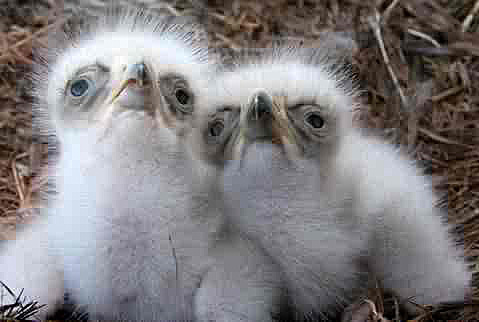 The fight for survival starts right away for baby eaglets. Since eggs are laid a day or two apart, the first chick to hatch gets the upper hand in the natural selection process. The larger chick with peck and attack the smaller ones while hoarding the majority of food that the parents bring to the nest. Often times, the second and third hatching chicks will fail to live past the first few weeks due to their bullying older siblings. You would think the parents might think to intervene, but no eagles don't protect the eaglets from each other. Talk about bad parenting. Interestingly, besides the occasional lion, hyenas have no natural predators at all. 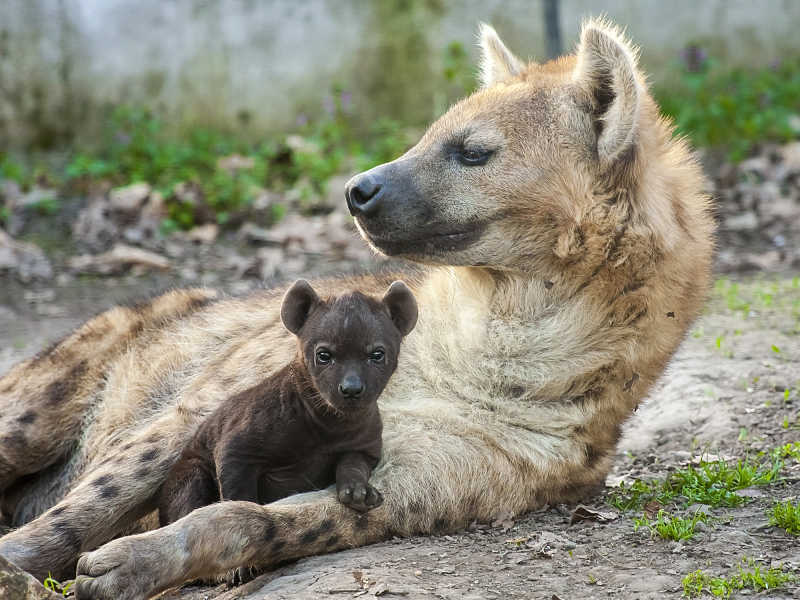 Therefore, the tendency for cubs to duke it out inside the burrow it quite handy for regulating hyena populations, the most abundant predatory species in Africa. Unlike most predatory cats, hyenas are born with sharp teeth and eyes wide open, which they use to establish dominance over one another. These brawls start at an early age and last for weeks. Although the adult hyenas try to separate them, as soon as they are out of sight, the cubs ae back at it. Furthermore, the cubs dig tunnels that their mothers can't possibly access to break up the fight. While the weaker cubs often die from their wounds, other times they are so traumatized that they refuse to leave the tunnel when food is brought to the back. This results in death by starvation. Although they're virtually harmless to humans, Sand Tiger Sharks are vicious predators towards each other. Female Sand Tiger Sharks have two wombs and each produces many eggs, which hatch while inside the womb. These embryos soon start developing teeth, which they use to kill and eat their brothers and sisters as well as any unfertilized eggs. The final outcome is only two survivors, one from each womb. This makes the Sand Tiger Shark the only species on the list to kill their siblings before they're born. By the time they are born, these sharks are natural born killers. Copidomopsis floridanum is a parasitoid wasp that's considered one of worst fratricides in the animal kingdom. An adult paralyzes a caterpillar by stinging it and then injects two eggs into its body, one being male and the other female. The eggs quickly clone themselves through a process called polyembryony in multitudes of 200 male larvae and over 1,200 female larvae. Out of those, roughly 50 females grow larger than their siblings, developing huge jaws but no sexual organs. These asexual demons then seek out their brothers to devour, because only one or two is enough to fertilize their fertile sisters. By doing this, these feminist wasps are able to ensure there's enough enough food to go around. That is, the inside of the caterpillars body... yum. In case you were looking for the definition of savage, this is it. 21 Animals That Are So Ugly They're Actually Super Adorable The Best Excuses to Get Out of Work Pygmy And Dwarf Animals That Are So Cute It Hurts The Greatest Scientist TV Characters The Worst Drugs for You 29 Celebrities Who Lost a Ton of Weight (Before and After) 15 Movie 'In Jokes' You Probably Didn't Notice The Most Horrifying Defense Mechanisms of Adorable Animals 28 Cute Animals That You Don't Want To Mess With The Very Best Dog Breeds, Ranked People With Major Health Issues Share The Warning Signs They Wish They Hadn't Ignored 12 Animals Eating with Their Hands What's Your Phobia?